Last week, a senior at El Rancho High School in Southern California, the proud son of a United States Marine, posted video footage of his government teacher berating him for wearing a sweatshirt celebrating the Corps. 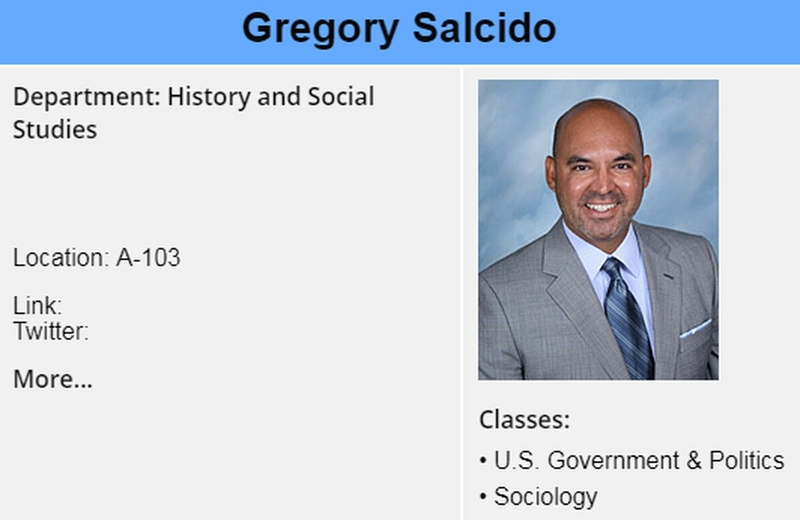 During the five-minute tirade, Gregory Salcido calls service members “dumb sh*ts” and “the freaking lowest of our low,” and repeatedly insults their intelligence and capability. He compares military recruiters to pimps and wonders out loud why they’re allowed to come into public schools. Finally, he tells the young man not to wear the Marine Corps sweatshirt to his class again. During my 15 years in the Army, I served alongside some of the most hardworking and intelligent men and women that this country has to offer. Now, as a businessman and entrepreneur, I pride myself on hiring and partnering with other military veterans. Why? Because they’re some of the most passionate and innovative people in the American workforce. As a member of the faculty at West Point Academy in New York, I encountered cadets with limitless potential, unbridled enthusiasm and some of the most inspiring young talent in the world. Not once did I use my influence as an educator to spread my ideologies or beliefs to young, impressionable minds. The role of an educator is to impart truth to one’s students, to teach them facts. Mr. Salcido’s comments were prejudiced, unfounded and ultimately detrimental to his students. I’ve personally lost brothers- and sisters-in-arms in overseas combat, and I can guarantee to you that these soldiers weren’t “dumb sh*ts.” They were brave — far braver than Mr. Salcido could ever understand. He has not known the fear of suicide bombers sneaking onto roads in the middle of the night to lay explosives, or the sounds of bullets whizzing past your face as you continue to charge forward into combat. He has not held a dying comrade whose life has been cut short by a faceless coward, nor has he had to tell a widow that her husband will never come home. He has not had to call his wife before a dangerous mission to tell her that he loves her, possibly for the very last time. That’s the life of a soldier, and it’s the life of our brothers and sisters serving in the Marine Corps. The saying goes that, “a veteran is someone who at some point signed a blank check made payable to the United States of America for an amount up to and including their life.” I challenge Mr. Salcido to acknowledge a single moment in his life when he was willing to make such a sacrifice. I challenge him to make the short trips to the Marine Corps Recruit Depot in San Diego or to Camp Pendleton to meet some of the “dumb sh*ts” who are training to go fight overseas for his life and his freedom. Mr. Salcido’s comments show just how little he knows about the criteria for military service, the training and education that we receive and the sacrifices that we are all willing to make for our nation and the freedom of the American people. Remarks like these do not just demonstrate the gap that exists between our military community and our civilian population, they widen it. Capt. Tyler Merritt is the owner and co-founder of Nine Line Apparel. Merritt is a former Apache Helicopter Pilot turned Special Operations Air Mission Commander. Following his graduation from the United States Military Academy at West Point, Capt. Merritt deployed multiple times to Iraq, Afghanistan, the Arabian Peninsula and South America.